Discussion in 'PowerPC Macs' started by shardey, Nov 29, 2010. I have had this quad g5 (dualcore 2.5ghz X 2) laying around for about a year that I purchased for $100 without a hard drive, super drive or a power cord. I was told that it was non working in the manner that ONE of the dual core cpu's had gone bad. I will be receiving my power cord this week to make sure that it still powers on but what the problem is. My question is: If only one of the cpu's are bad, what is the part number I will be looking at? I am not wanting to spend a fortune on this to fix it, but If I do get it working I would like to drop 8-16gb ram in it, and setup a raid with 2 raptors. First two links are for 2.5 Dual Processor, not Dual Core. Last one looks like Dual Core but listed part number doesn't match with official one. These CPUs (in matched pairs) were sold with LCS, never separately. That's why listed part number does not match. Did you receive my email (that right one, with attachment)? Yes, once you get it to test it and it boots but doesn't chime. You can remove the processors and try to swap the bottom one to the upper slot. Dual processor G5s will boot with one processor as long as it's in the upper slot. After changing processors you will most likely need to run a thermal calibration. You need to find an Apple Service Diagnostic disc version 2.6.3 to use for the Quads. As far as I know, there are only two different model numbers on the Quad CPUs and you need a specific one for your logic board. Both CPUs have to have the same model number too. If you need the latter ones, I have a few that should work as I purchased them for mine but I didn't know at first that I needed the *7419. But the first thing you should check for before even plugging it in is check for leaks. I have taken it apart and pulled the cpu out and haven't noticed one bit of leaks. Whenever the power cable comes in I will be able to find out what is wrong with it. Do you have any idea where I can get the 2.6.3 Apple Service Diagnostic disc at? This is the Delphi liquid cooled system (which I believe had the most problems?). though there were quite a few issues with the LCS, i believe its much, much over rated than it actually is. Unless you have a machine that ran 24/7 since new, they may be fine. Make sure to check for leaks before plugging anything in, and also check the drip paper on the bottom... if that looks suss, dont plug it in. Mine was perfect... but it still doesnt hurt to check.. I know for a fact there hasn't been a leak in this system. The gentleman I purchased this off of for $100 just gave the system to me and informed me that I needed to replace the cpu's. I assumed it would have been just one. I finally got the power cable in and it turns on and there is no video output and all the fans turn on low then to a medium setting. The CPU A and CPU B led lights are lit up. Could this also mean that the LCS is malfunctioning? it will not leak if there are no more coolants in it. That must have been one hell of a leak then since there is quite a bit of fluid in there. There is probably a clog. Can you hear the pump working? Just got a new part in for the quad. It still appears I have both CPU A and CPU B led lights on. What is the good trickle light that stays on too? This time I can hear the fluids inside swooshing around, so I think the other may of either got plugged up, or if it leaked it managed to miss the power supply. What approach should I take next? 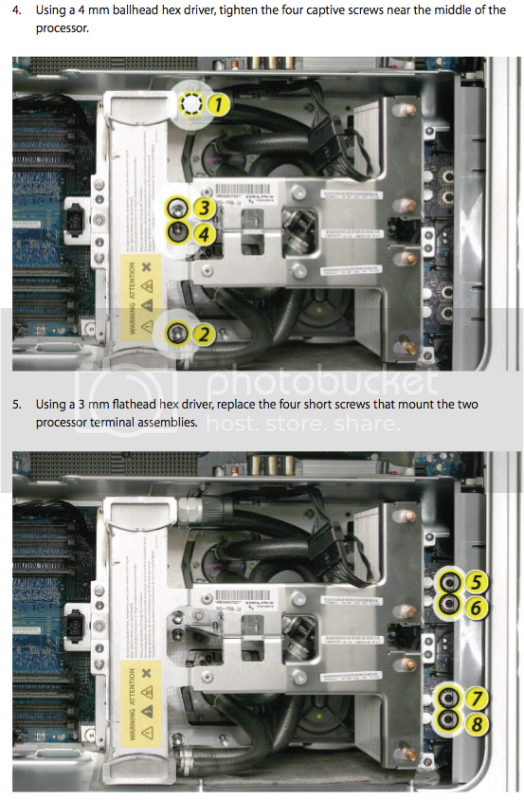 My CPUs were not working until I followed the tightening sequence exactly as written in the service manual. You need to tighten the 4-4mm standoffs first, then work your way out. Then I heard another pop, and they seated. Let me know if you'd like a photo of the sequence. The trickle light will illuminate orange when the air deflector is removed but the computer is turned off. That basically just verifies that the power supply is supplying enough current to turn on the computer. So this probably explains why I can short the computer out when it is on and I apply pressure to the entire heatsink. Could you post as many pictures as you can with this? There you go sir! If movement shorts the computer out, this will surely help you. Loosen everything then re-do it as per these images. It's imperative that the "float plate" screws stay loose until the end, as the CPUs need wiggle room while the rest of the LCS gets tightened above it. The float plate screws torque the CPUs in place once everything's seated. Thank you so much! I have one problem though, before I get started doing this I think I have may misplaced the screws to secure the cpus in place (screws 5,6,7,8). How important are those screws in sense of making the computer functional? My other concern is that the other CPU's were actually working but the LCS had a problem, as I can now here it swooshing around liquid. Maybe the other leaked out and shorted mother board. I do have another logic board coming that is functional, purchased from ebay and shipped for $68. I will be attempting to find screws today to try to fix this. Well in that case, those 4 missing screws are undoubtedly the reason for your issues. Those fasten the power supply wires to the CPU boards, which obviously provide them with electricity. Is there a chance those screws fell into the bottom of your computer, under the power supply? I've been able to retrieve screws from under there, by shaking the computer in random directions, turning it upside down, etc. You REALLY need them. Once they're replaced, the other problems might go away. Every system in these computers seems to rely on another system for proper function. That's a killer deal on those two Macs, btw. Can someone provide me the part number for the PANASONIC LCS for the Quad G5? The service guide makes no mention of the Panasonic type at all. It only mentions the original and the revision 2(dual pump) models. 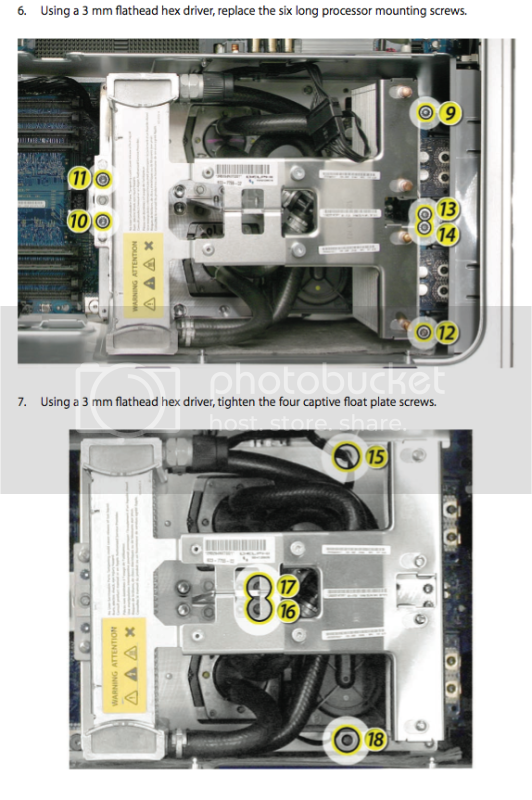 "Why would Apple not include this part number in the service guide?" I got it working! Only problem is that apparently one of the cpu's over heat after being logged in for a few minutes. I will be running the Thermal Calibration test today or tomorrow to see if that will fix it. Thank you for all the help, it is nice to see there are some intelligent people out there that like to share their knowledge rather than being a sarcastic prick about it. Great! I'm glad I could be of service Are you still running without the screws though?! I wouldn't expect the computer to even boot without them. No they are installed and they have to be for it to properly be running, otherwise it will show the error leds of Insert cpu A and CPU B. Did thermal calibration fix the overheat problem?